T-Mobile today announced that it is doubling the speed of its HSPA+ network to reach theoretical download speeds of 42 megabits per second (Mbps). T-Mobile customers in cities like Los Angeles, Phoenix, Chicago, San Francisco, and Miami (among others) will benefit from the increased speeds and network reliability, the company says. 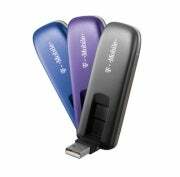 Along with the increased network speed, T-Mobile announced a new wireless modem, the T-Mobile Rocket 3.0 laptop stick. The Rocket 3.0 will be the first device to take full advantage of the 42 mbps (theoretical) maximum speeds, and will be available for purchase May 25th starting at $99 (after a $50 mail-in rebate and new 2-year contract). The Rocket 3.0 will be one of many 4G-branded devices that T-Mobile plans to ship this year. As AT&T's proposed acquisition of T-Mobile awaits approval by the FCC and others, T-Mobile appears to be staying true to the network build-out plans it had announced previously.